Painting Bible – The Darkside Cowboys! Well, in an effort to be able to go back and add new models to old forces, I need to record the paints I’ve used! Lets start with my Darkside Cowboys! Armour – GW Macragge Blue base, layered Valljo Arctic Blue Metallic, washed AP Blue Tone, Drybrushed GW Leadbelcher. Well, with the announcement of a re-release of Bloodbowl from Games Workshop in 2017, there’s a lot of excitement about the game! It’s worth noting, though, that there has been lots of activity in the Bloodbowl area for years, even without GW support, so here’s a look at some of the cracking teams and options that are out there. Rather than breaking it down my manufacturer, I thought I’d break it down by race! First up, Dark Elves! NB – As I come across more bits and pieces, I’ll hopefully keep this up to date with new options and models. This is probably my favourite looking Dark Elf team at the moment. Its a vicious looking greek style armour, with all the positions you’d want for a Dark Elf team, and the slightly unusual theme really makes it distinctive (with a solid nod to the original 2nd edition GW team). This team is quite neat with some very dynamic poses. To me, though, it feels a little bland with the slightly generic elf but spiky look. The sculpts aren’t up to the standard of some of the more modern style teams here, but there is lots of character in there with a decent range of positions and poses. This team has been on the market since before GW stopped selling BB! Its a cracking set of sculpts, if a trifle cheesecake! Still nice to be able to field a female team on the pitch though! I must confess, I have a full set of these 🙂 And if you do a lot of the skin areas as lycra, they actually look pretty fun. One useful note – there are a wide range of extra models for the team beyond the core – both extra poses for the various positions, but also for the various support roles, such as cheerleaders, mages, coaches, security and so on. I’m not terribly enamoured by these, as there isn’t enough different sculpts, and the clothing choices are … odd. Mind you, paint the exposed skin area as spandex and it’d actually look pretty good. Well, the first week of hobby in 2016 is over, and what have I done? Nothing! Or, at least, very little! I’ve been looking through what I have, rather than getting active hobby in. I’ve opened Imperial Assault and the Force Awakens X-Wing starter sets that I got for Christmas, though have to pop tokens and sleeve the cards still. I have to say, I am blown away by the quality of these sets. Great value, cracking miniatures, clear rules, good introductions, and easy to add to. Really looking forward to trying them out – I play X-Wing already, but looking forward to getting a couple of new x-wings out with the falcon! I’ve also started my 2016 involvement in #WAAC, with the purchase of Lanyssa from the Minions faction in Hordes (from Privateer Press) to be painted up for a charity raffle later this year. Obviously the plan is Green and White colours … and I do enjoy painting elves! 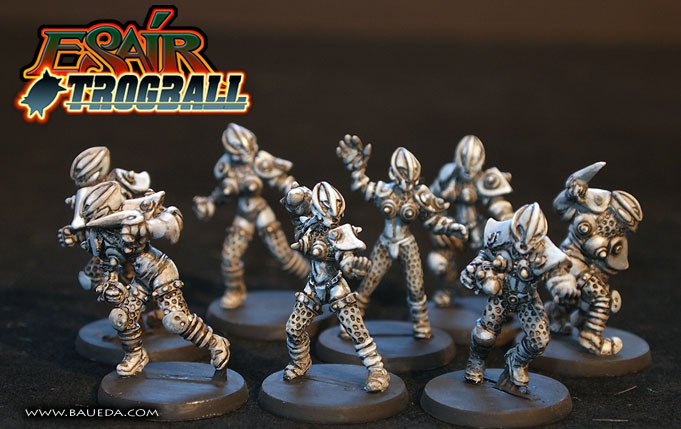 With the announcement of Bloodbowl from GW again, my enthusiasm to get some teams painted is through the roof! I may have acquired a team of Wicked Elves from Shadowforge this week. I’m probably going to go with a bodysuit colour rather than flesh, making them a little less wicked! Blue and Yellow Darkside Cowgirls are planned! I also got a set of elf catchers I was missing to finish off my Elf ladies that I plan to paint in the red and blue of the Galadrieth Gladiators! Looking forward to trying out some Vassal Malifaux and Guildball to get to grips with the rules too!